Sylvia White entered the Los Angeles art scene in 1979, as founder and director of Contemporary Artists' Services. For over 30 years, she has been known and respected as a pioneer in the field of career management for visual artists. ArtAdvice.com was launched in 1998, when the internet was still in its infancy. Since then, she has represented a handful of artists, who rely on her wisdom and experience to place their work in galleries and exhibitions. She has had exhibition spaces on both coasts and is now expanding her services to collectors interested in obtaining museum quality work. 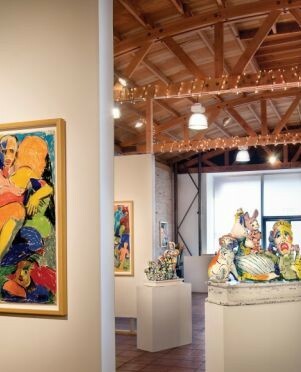 Ventura, California, a sleepy beach town between Malibu and Santa Barbara is the home for Sylvia White Gallery, established in 2008. As the first established art gallery to make the move from Santa Monica to Ventura, White is committed to bringing museum quality work to the Ventura county area, continuing her role as a pioneer. Sylvia White Gallery exhibits painting, sculpture, performance, installation and photography by emerging, mid career and established artists of exceptional quality. Exhibitions have included such notable artists as Ed Moses, Robert Rauschenberg, Ed Ruscha, John Baldessari, William Wiley, Viola Frey and many others. The gallery also hosts a monthly performance art series, curated by John M. White, for Ventura First Fridays. 5x5x5 is an evening of 5 artists, 5 performances, 5 minutes each. Click here to watch a compilation of the first season.